The area that became Monroe County has evidence of the earliest human activity in the Mississippi area. The Hester Site, an archaeological site just west of Amory, is the location of apparent Paleo-Indian activity dating to about ten thousand years ago. The area was important in much of Native American history, including some Choctaw movements during the Chickasaw War in the 1730s. In the 1800s it became an important plantation area. The county seat is Aberdeen, located on the banks of the Tombigbee River. Located in northeastern Mississippi, just south of the hilliest areas of the state, Monroe County was founded in 1821. In its first census in 1830, Monroe’s population consisted of 2,918 free people and 943 slaves. By 1840 both populations had increased dramatically, to 5,167 free people and 4,083 slaves. By 1860 Monroe had 12,279 slaves and 8,554 free people. In the late antebellum period, it was an agricultural powerhouse, ranking high among the state’s counties in corn (fourth), cotton (seventh), sweet potatoes (second), and livestock (eleventh). The county’s 120 industrial employees worked in small lumber mills, cotton gins, and businesses making carriages and saddles. In the late antebellum period, Monroe County had one of the largest populations in Mississippi. In 1860 Monroe was home to twenty-five churches—fifteen Methodist churches, seven Baptist churches, and single Presbyterian, Christian, and Episcopalian churches. In 1872 part of Monroe County became part of Clay County. Despite this loss of territory and population, Monroe continued to grow and by 1880 was home to 28,553 people—18,001 African Americans and 10,551 whites. The county’s farmers ranked first in the state in the production of corn and wheat, second in hay and tobacco, and third in livestock. Owners cultivated 46.5 percent of the farms, while tenants and sharecroppers ran the rest. Some of Mississippi’s most important political figures and political action had roots in Monroe County. Reuben Davis, an Aberdeen lawyer, was an impassioned supporter of secession and an opponent of Republicans during and after Reconstruction. Samuel Gholson, a supporter of secession and later a Confederate general, served in the state legislature and supported the overturning of Republican authority. Monroe County’s postwar Ku Klux Klan committed a notorious political murder, killing Jack Dupree, an African American leader of the Republican Party. In 1880 Monroe County had fifty-three manufacturing establishments, but most were small, and they employed only one hundred men, four women, and nine children. The county was home to 134 immigrants, most of them from Germany, Ireland, and Sweden. By 1900 the Monroe County population had grown to 31,216, and manufacturing employed more than 500 workers. While 59 percent of the county’s white farmers owned their land, only 8 percent of African American farmers did so. About half of the Monroe County church members counted in the 1916 religious census were Baptists, with Missionary Baptists standing out as the largest group. Methodists, especially the Methodist Episcopal Church, South, and Methodist Episcopal Church, had substantial numbers as well, and the county was home to Mississippi’s largest groups in the Stone-Campbell traditions—the Disciples of Christ and Churches of Christ. Monroe County’s notable figures include F. S. McKnight, Felix Underwood, and Lucille Bogan. McKnight ran a photography studio in Aberdeen for more than thirty years, and his work documented the life of the community. Underwood, born in Nettleton in 1882, became a doctor and leader in reforming Mississippi’s public health system. Bogan, a blues singer, was born in Amory in 1897. By 1930 Monroe County’s population had reached 36,141, with about 20,000 whites. 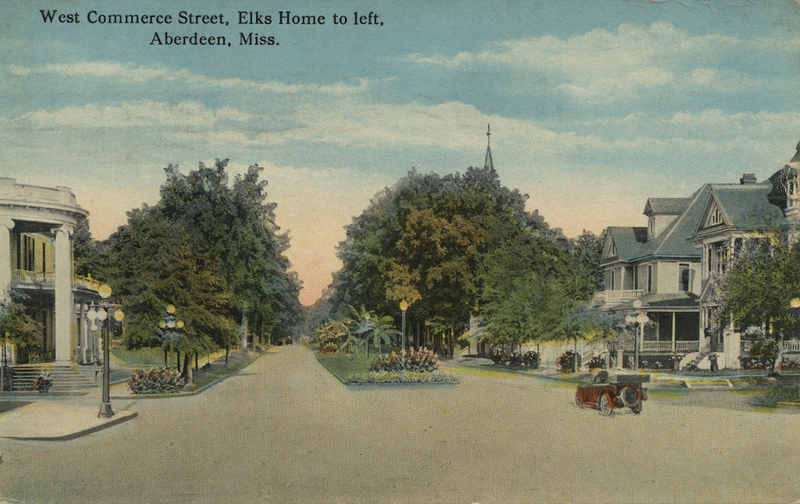 Aberdeen was a growing town with more than 6,000 people, and the county had more than 400 industrial workers. Still, agriculture remained the central feature of the county’s economy. Tenants worked 68 percent of county farms, emphasizing corn followed by cotton and livestock. After more than twenty years of effort, Mississippi’s oil and gas industry began when the Carter No. 1 well east of Amory started yielding gas in 1926. Monroe County also became the home of one of the state’s first cooperative electric power associations. In 1960 Monroe County’s population had dropped below thirty-four thousand residents, about two-thirds of them white and one-third African American. Monroe was one of eastern Mississippi’s leading manufacturing centers, with 32 percent of the county’s workforce employed in manufacturing, including almost two thousand women in the apparel industry. Monroe County had by far the state’s largest number of apparel workers. Agriculture remained crucial to Monroe’s economy, with nearly 18 percent of the county’s workers growing soybeans, corn, cotton, and wheat and raising livestock. By 1980 the population had increased to 36,404, slightly higher than its 1930 numbers. As in many of its neighboring counties, Monroe County’s 2010 population was predominantly white and had shown no significant change in size since 1960. The county’s 36,989 residents represented only a slight increase over 1900.